Mobile phone shop on North End. 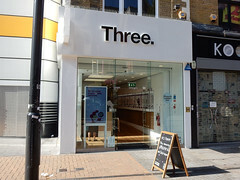 It was previously branded as "3 Store" photo, but changed to "Three" some time between July and September 2015. According to a photo on Flickr, as of c. 1985 the premises were occupied by a shop called Jeans West. Last edited 2019-01-08 15:26:46 (version 43; diff). List all versions. Page last edited 2019-01-08 15:26:46 (version 43).